If you can't find common language with Russia then you mustn't bow, whine and weep. You have to search opportunities in another part of the planet. So it was an announcement of direct confrontation that was ripening last months. 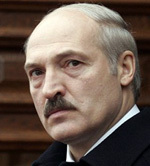 Lukashenko tried to stop Russian economical expansion on Belarus territory because the state didn't get enough in exchange. There were the political disputes. Moscow was offended Belarus didn't acknowledge independence of two Georgian rebel regions Abkhazia and South Ossetia. Besides Belarus entered the Eastern Partnership, the EU initiated project that hurt Kremlin's pride a lot. Banning imports under false pretences is a usual Kremlin tool to influence on former Soviet state. The most famous ban was in 2006 when Russia said Georgian produces were not enougn qualitative and unhealthy. It is known the second way to make pressure is a sudden stop of the gas export that was a reason of many scandals. The global economic crisis, bad trade, blockades and conflicts with neighbours and corruption gives bad results for Russia. Prices for food products in Russia grew ten times more than in the European Union from January to April, according to the Federal Statistics Service, the St. Petersburg Times reported. According to estimate of the Russian government Belarus exports to Russia 4 million tons of milk that is 2/3 of all Belarus milk production. Belarus milk products are 30-50% cheaper than Russian ones.